Older Houseboats with Steel Hulls - Repair and Replacement Costs? We have a question about older steel hull houseboats, when it comes to checking, maintenance, repairing, and or replacement costs? How do you know when the Hull needs painting, or even checking for rust or corrosion? What clues will tell me if I need to get these things done. We just bought a 1975 SumerSet Houseboat with a Steel Hull. The house boat was all redone inside, but the previous owner said it's been about 10 years since they had steel hull checked. Thanks for any info, Spike. Well Spike, congratulations on your purchase of a 1975 Sumerset Houseboat, they are a great model, with many of them around. If I'm not mistaken, it was around 1975 that Sumerset started to offer customers an aluminum hull version, alongside of their steel hull versions. Your question is a common one, since all hull materials require different levels of maintenance. When we look at steel, a natural process is the rust, thinness, and pinholes that can occur. 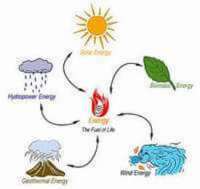 Rust & Red Oxide occurs when air and water comes into contact with iron. In retrospect, years ago, basically all houseboats were made or constructed with steel hulls, and then came about the aluminum and fiberglass models. General consensus is that a "poorly maintained" steel hull houseboat is at the "end of it's life" and will cost money to have it disposed of. Eventually costing more to repair and replaced all the rusted steel that it becomes a total loss. A yearly maintenance program on a steel hull houseboat is almost an necessity, since this is what will keep the steel from rusting in the first place. You want to keep an eye on the bilge and all the hull interior areas since this is likely where most of it starts. You would to clean or sandblast the areas, and paint with epoxy paint. You didn't mention what size of houseboat you purchased, so these will be "ball-park figures". If the houseboats needs to be hauled out, and launched, you could be looking at anywhere between @ $300 to 1,000 dollars. If the houseboat needs to stay out on blocks for an extended period of time, you can calculate anywhere from @ 10 - 30 dollars per day for yard storage. looking at anywhere between $10,000 to 30,000 dollars depending on the length and beam. Now if you're only looking to have certain areas re-plated or repaired, you're looking at the cost of a welder, steel plates, and anti-fouling or coal tar epoxy. 1) Many insurance companies are making it very difficult to insure older steel hulled houseboats, and requiring very detailed marine surveys. They are worried about insuring "high risk, and high liability houseboats". 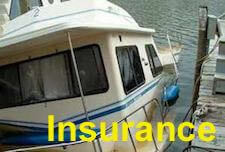 Should you have any problems with insurance, have a look at our houseboat insurance page for tips and potential houseboat insurance companies. 2) One of the big advantages of steel houseboats, they take an impact very well, and can be easily repaired, and if the hull thickness becomes thin, new steel plates can be welded in place to completely repair the situation. 3) You can protect the hull (below the waterline) with either "anti-fouling paint", or "coal tar epoxy". Both are a preventative measure and worth the expense since the houseboat is already out of the water. Both can last years if the surface is properly prepared and applied. 4) As simple and easy way to verify and check the condition of the hull without having the expense of a "haul-out", you can consider to hire a diver to inspect it yearly. Many marinas have divers available to inspect, repair, and retrieve items. The prices are reasonable, and can range from @$100 to 300 dollars. 5) When it comes to the exterior maintenance, you can brush away any rust, and paint with with a metal paint of your choice. Some paints are better than others, but that's another big discussion. One of most important steps is once the area is ready for painting, I highly recommend applying a coat or two of Rust Metal Prep. I have personally used Rust Prep, and was amazed at the results. What Metal Rust Prep does is render the surface rust totally chemically inert, thus preventing future rust from starting. One of the additional benefits is it also acts as an excellent primer for whatever topcoat that you apply. 6) There are no "perfect houseboats", they all have pros & cons, so just take it all one step at a time, and eventually the list of things "To Do" are done. Enjoy your houseboat. 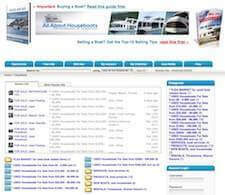 Lastly, hopefully some of our readers will share and post comments about their steel hull houseboat experiences. Comments for Older Houseboats with Steel Hulls - Repair and Replacement Costs? I want to cover my exterior decks with wood. I'm not sure what would be the best decking planks to use. I want something beautiful, strong and long lasting. Any recommendations? The cost of steel hull restoration. We restored a 1966 Lazy Days for a total cost of $30,000 (it's crazy the prices). After the hull was sandblasted, it was like swiss cheese (all of holes) and needed 6 sheets of steel welded to the bottom. We used a special primer and paint. It has been 6 years since, and we haven't looked at it but should. We put way too much money into, moving it, sandblasting it, restoring it, etc... so we kept going. We shouldn't have. I could have bought one cheaper, but State Farm insured it after we got a survey. Can you build cabin over side decks, bow deck? 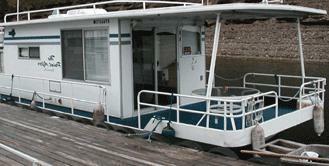 We are looking at a steel River Queen houseboat. Can we build new cabin out to the toe rail over the side decks? Can we move the cabin forward over the gen foot bow deck for more interior space too? Fill the steel pontoons with closed cell marine foam and be done with it. I have a 66 foot houseboat that I built myself and I prepped the pontoons by sandblasting them and painted with coal tar epoxy. Than I filled the pontoons with closed cell marine foam. I also put magnesium and zinc anodes on it, so it should last my lifetime. I have pulled my 1975 35 foot Boatel houseboat out. I have taken all of the paint and most of the coal tar epoxy off, only a few spots remain. Underneath it all, is a coating of what looks like bondo, it is stuck down pretty good, so I don't want to take it down to the steel. I am not interested in anti fouling paint, just want to know what to put on next that will stick and preserve the cylinders. I have considered using flex seal liquid rubber but just not sure. Thanks to anyone with advice, Rusty. It should be noted that you NEVER paint the steel on the inside of the hull. The coating will trap moisture, and the steel will quietly rust, out of sight. Leave it bare, keep it dry. Steel boats generally rot from the inside out. I've been looking for a boat for about 4 months now. My wife and I plan on it being a live aboard as well as a business. We are also planning on being in the gulf coast of Florida, with the option of heading to the Keys once a year. I've read all the opinions on steel hulls, but I somehow cannot get past the strength of steel. Is aluminum a reasonable comparison for steel, considering we plan on traveling with our boat? I've come across a 63' steel tunnel hull that has been in fresh/brackish water most of its life. Is a steel tunnel hull rare for a houseboat? Hello, I just put my '66 38ft. Riverqueen back in the water after a 16 day project. It had a new keel welded on in 1992. It was still in good shape. I found some thin spots in the rear, right under the engine. The shocker was the electrolysis. She never had anodes. After grinding, plating, and lots of epoxy and coal tar, she's back in the water. I also installed 3 large anodes. From now on it's going to be a once a year thing. I did most of the work myself. I haven't sat down and added everything up, but I'm guessing it was around $3k. I'm thinking it's a 5 year fix, maybe longer if maintained properly. We'll see. Susan, I had a '72 RQ. A great vessel. Everything is simple to work on. Not sure what your problem is with yours. If it is the bottom or hull you are concerned about, have the rascal pulled and if the boat does not have the sacrificial anodes, it would be in your best interest to have it sand blasted. You or someone will have to be there to wipe it down with a prep wash immediately or it will start to rust in no time. Don't be stingy with it either. It may take you 10 gallons for the entire hull below the water line. To do a bare metal inspection, I would recommend any "paint thinner" but not "laquer thinner". This comes later. The paint thinner will leave a thin coating for a while to prevent rusting. If you find any pin holes or "dimples" in the hull where electrolysis had been eating away at the steel, a good marine grade two part steel epoxy will take care of this. But, just before you apply the epoxy, wipe that area with Laquer thinner, Acetone or the like. Removes the film left by the paint thinner for best adhesion. Some 100 grit sandpaper will smooth the epoxy nicely. After this is all done, and the epoxy setting time is over, have the bottom primer paint ready, wash the bottom with Laquer thinner or Acetone or the like, but NOT paint thinner. This should only take about 5 gallons as it is not really a wash. Just removing the paint thinner and any light surface rust. Work your way around the stern and back towards the bow staying about 10 to 15 feet behind the washer. Then the bottom paint. The Queen I did is still running stong after almost 20 years. Let me know if you have other problems. I do know a little about Queens. I hope this helps, Ray. 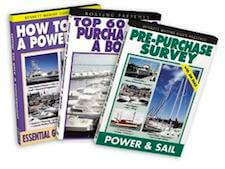 Well Ray, I would to thank you for sharing all of this great and thorough information on redoing a steel hull houseboat. I can see that you're speaking from experience, and this will help my many folks. I'm an owner of a 1972 Riverqueen houseboat. First time buyer and I got scammed...I didn't know to have it inspected, etc. Currently renovating on lakefront retirement lots. Stay tuned. 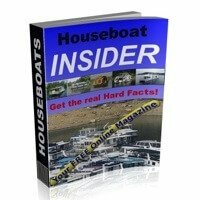 Sand and repaint a steel houseboat hull - How often? I have a 1971 Stardust Cruiser (50') steel hull houseboat that I purchased on Lake Lanier in Atlanta, GA in 1997. I had a certified marine inspection done before I purchased it and the inspector said the hull was in excellent condition. He said a new "beaching plate" had also been welded on the front end by a previous owner. I heard you are supposed to sand and paint the hull on these steel boats every 4 - 5 years so I have had it out of the water and painted twice, once in 2000 and again in 2004. It is a very expensive proceess and I suppose I am overdue to do it again. My question is, is it really necessary to paint the entire hull that often? Is there any point in having a diver inspect it at this point or should I just go ahead and haul it out and paint again? Also, I am a diver so I could certainly inspect the underside of the boat myself but would I know what to look for or does it require a trained eye? 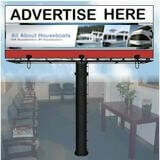 I am busy building a steel houseboat in South Africa to be used on a fresh water lake. It is going to be 24m X 9m and will weigh 60 tons or more. The pontoons are complete and I now have to apply the floor. There are so many different materials one can use for the floor construction that it has totally confused me. Please give me advice on how to construct and the material to use for the two floors. I am slowly building pontoons for a houseboat from steel, and would appreciate information on sacrificial rods used to prevent corrosion. Hi Charles, the keywords you're looking for sacrificial rods, would be magnesium and zinc anodes. My houseboat project has a steel hull too long neglected to be easily or cheaply repaired. But the upper structure is worth saving, as it has oak floors, and 2 bathrooms, 2 bedrooms and 2 floors etc. Built in 1990 as a Float Home on a steel hull style barge, with a pointed bow, but no motors, 40 feet x 16 feet, 2 stories with 3rd story patio deck, flat bottom, hard chine steel, displacing apps 30,000 pounds. My IDEA is to haul out and cleanup the hull with sandblasting, epoxy seal and patch the worst spots, and paint it. But to not refloat it as a boat. by nesting the hull by crane down into a pre built cradle like framework which holds the foam blocks, which will support, float and attach securely to the hull, making it an unsinkable, permanent float home. With a new 3 foot wide walkway running along both sides of the 40 foot hull, on top of the new foam blocks beneath. (3'W x 3' deep x 40 feet of foam x 2 sides) should support 39,000 pounds. Based on styrofoam's ability to support 50-55 lbs per sq foot). The added width and extra 9,000 lbs margin is for extreme snow load events, excessive people on board and for lateral stability during possible moments off center loading). Can you comment on this IDEA, and any alternative suggestions or similar known conversions of a Houseboat to a Float Home, Or other Steel Hull conversion to a positive floatation shell? It seems like a good way to salvage a nice little 2 bedroom float-home out of a leaky old steel hull.